This story was produced and published by mondo*dr magazine and reproduced here with the kind permission of the magazine’s editor. Despite being open for over 15 years, Lux Fragil is still a popular party hotspot in Lisbon. It was recently treated to an audio upgrade that included XTA’s new APA Series and Funktion One’s new Evo Series. Working with only the best quality materials to furnish and fit the interior, and with amazing attention to detail, Lux Fragil lives up to its name by choosing high design and enviable style, aspiring to a level that has attracted celebrities such as Cameron Diaz and Prince over the years. Indeed it is part-owned by actors John Malkovich and Catherine Deneuve, and is still seen, 16 years on, as one of Europe’s most fashionable night spots. Over three levels, it offers a main first floor bar and lounge with a terrace that encompasses two sides of the building offering stunning panoramic views, a large dancefloor at ground level, and a rooftop looking out over the city and river Alfama. The décor in the main bar and lounge is kept fresh by contemporary artists’ installations, the controversial huge chandelier – a temporary fixture completely made of tampons – remains one of the most talked about! The venue is also particularly proud of its Brazilian hardwood dancefloor – a true luxury that has stood the test of time and now looks awesome after some years of ‘partying-in’. However, whilst some aspects of the interior have become better with age, such as that dancefloor, technology is always progressing and none quicker than audio – the beating heart of any club. 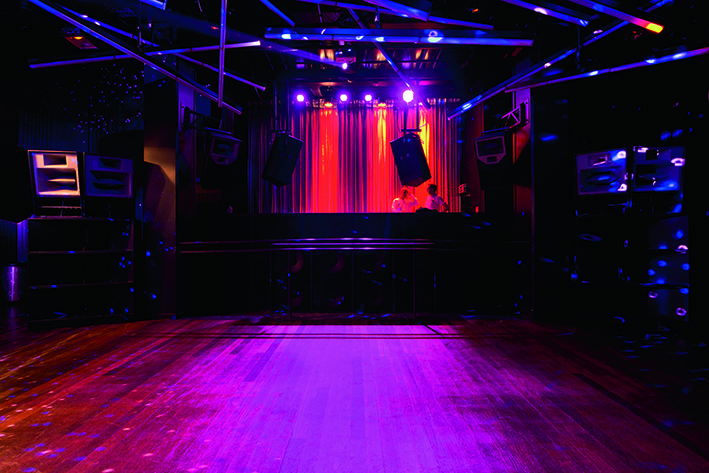 In 2006 the club had an extensive refit including a cutting-edge Funktion One system for the main bar, lounge and dancefloor, powered by a combination of MC2 amplification and XTA processing, with some of the less demanding areas – such as lounge fills – utilising some of the original equipment. Time hasn’t stood still, and to bring the club’s main dancefloor system right up to date, a refit has been designed, specified and overseen every step of the way by Chris Hawkes, owner of Solution One audio specialists based in France. Swapping out the Funktion One Resolution system for a new Evo 7E system, and augmenting this with more subwoofers, has gone hand-in-hand with the need for new processing and amplification. Moving forward to today, this is where XTA’s new APA Series comes in – powering both the Evo 7E system and the new BR221 subwoofers. Two Evo 7E loudspeakers and two BR221 subwoofers either side of the DJ booth are powered by an APA, with additional F218 cabinets distributed around the venue being powered by MC2 E45 amplifiers and XTA DP448 processing. Side fills, rear fills and DJ monitors are all take care of by Funktion One Resolution 2’s and once again more MC2 E Series amplifiers and XTA processors. In the bar area, 12 Resolution 1’s and four Resolution 1.5SH enclosures, 12 F88 loudspeakers and 10 MB212’s are powered by four of Full Fat Audio’s new FFA4004DSP G2 amplifiers, two Full Fat Audio FFA6004’s and a single Full Fat Audio FFA4004.